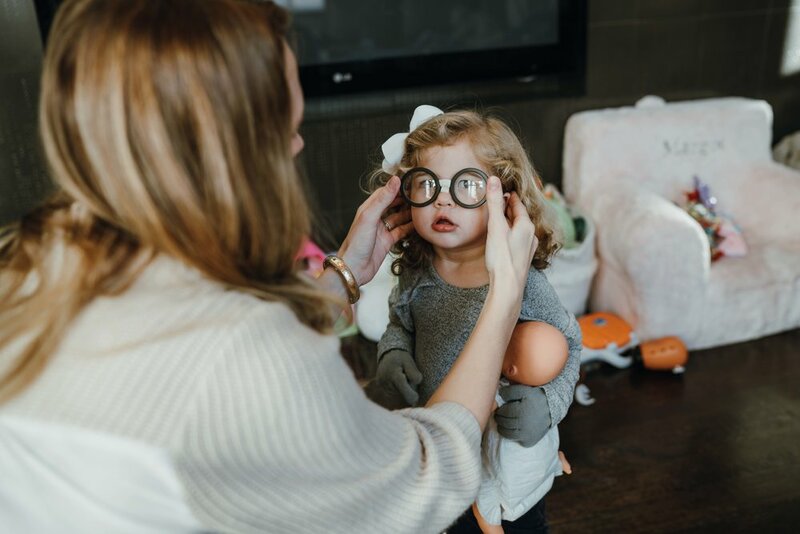 I have to be honest, I’ve been wanting to do more and more of these in-home sessions partly because it’s winter and it’s not fun doing cold photo shoots, but also because I think they capture the family in such a more authentic and real way. 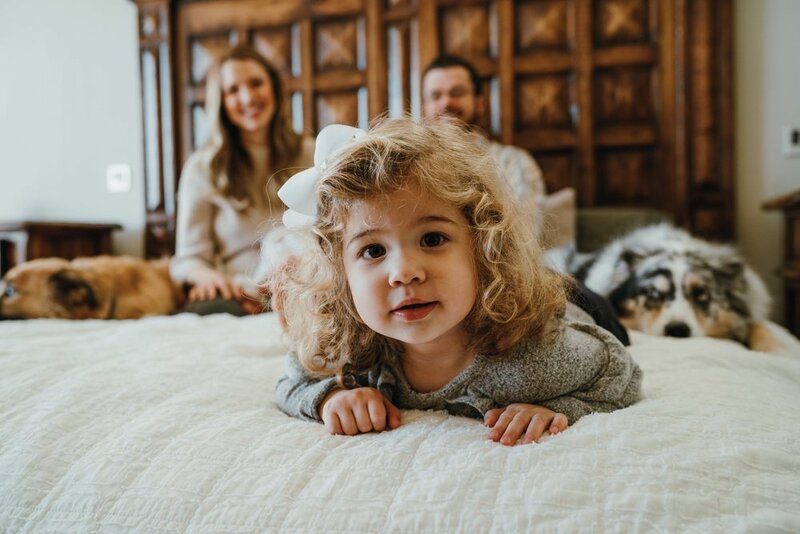 So when CC reached out to me looking to have her family session indoors, I was pretty excited to do this shoot and try to tell their story through photos. 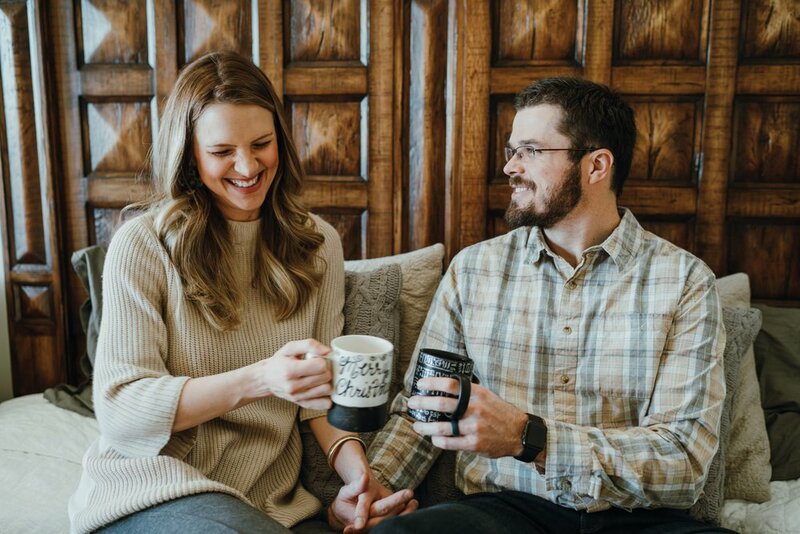 CC and Connor moved from Dallas in November and are living in CC’s father’s house in Cherry Creek until they close on their house in the Berkley Neighborhood. So they moved to Denver in November and then just two weeks ago, had a brand new baby boy, Hudson! So this was a family session as well as a newborn session. And Margot is their daughter, age 2. The house was amazing but it was a disaster inside. Bottles, diapers, pacifiers, toys. What you’d expect after bringing a brand new baby home. They had the master bedroom somewhat clean. The bed was made. But I told them not to worry about it because this is their life. It’s not perfect. It’s not clean. A two week old and a two year old in a house that’s not even theirs. Let’s document this special moment in your life the way it really is. We started in their master bedroom and had everyone on the bed. This was the natural spot to put everyone and we did plenty of different poses and even some with their two doggos Hazel and Wiley. They were good dogs and great with the kids. 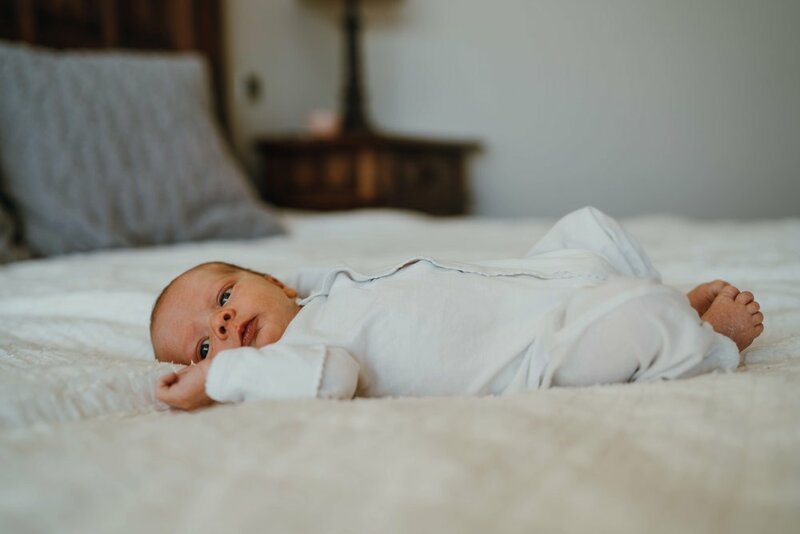 Margot took a little bit to get used to me and I should have taken some more time to ge to know her a little before taking the camera out, but baby Hudson was awake and I didn’t want to waste any precious moments with him. I had brought lighting equipment just in case, but the room had beautiful natural light and honestly, I was worried that setting up studio lighting would freak the kids out. So I kept the lighting packed away and just used the beautiful natural light from their south facing windows. After the master bedroom, I wanted them to continue their morning like they normally would. They weren’t ready for this but I asked them, what would you do on a Saturday morning? Where do you guys hang out? The kitchen. So we went downstairs and had some time on the couch with Cece and the kids before moving into the kitchen. 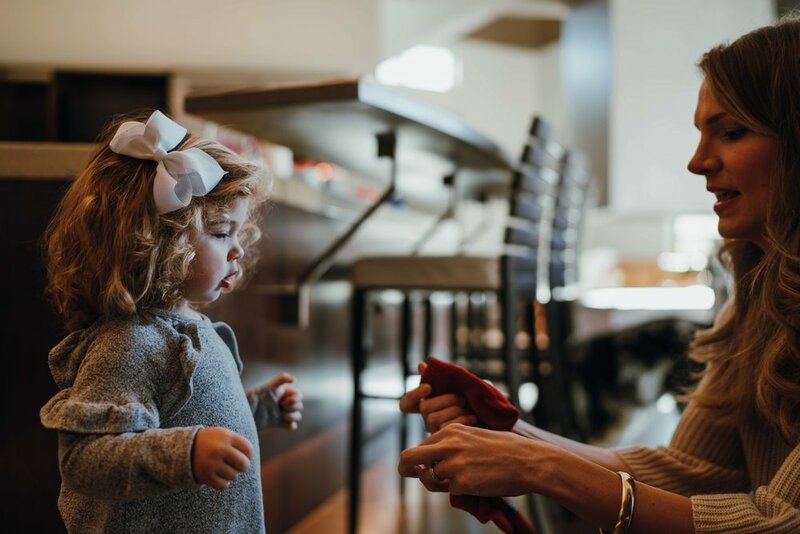 Cece told me she usually has both kids up on the counter while shes filling bottles, making snacks, or whatever else moms of a newborn and toddler do to make sure that everyone is happy. I had so much fun hanging out with this beautiful family and so glad I got to document such an important time in their life. I hope these photos are something they will cherish forever and it is one of the reason I love getting to be a family photographer in Denver. I am looking forward to doing more in-home sessions to offer families the chance to document their real life moments. 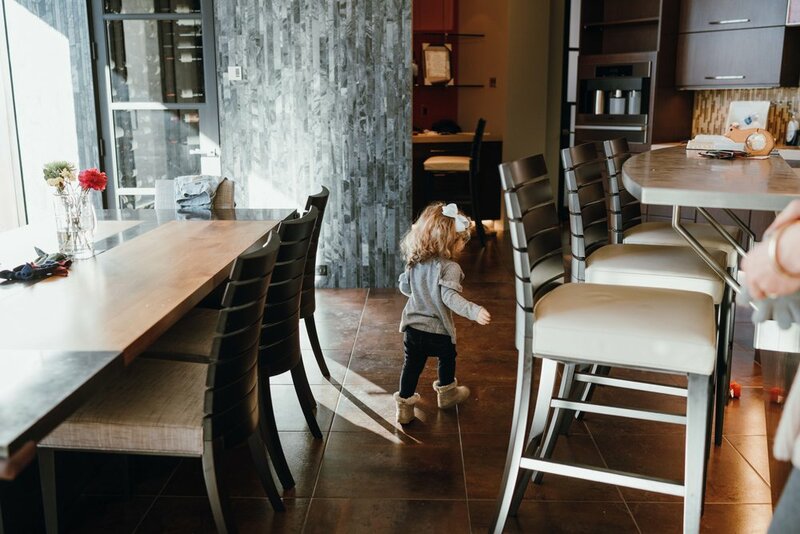 Are you looking for the best Denver family photographers? You’ve come to the right place. 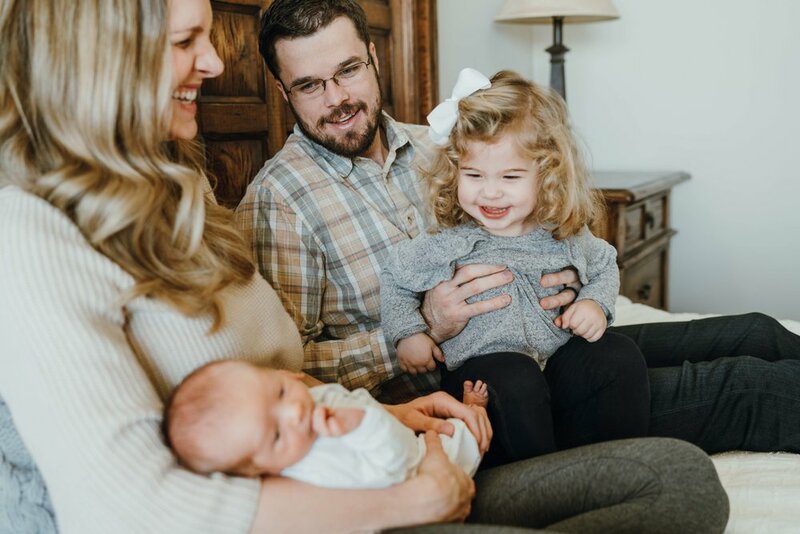 Tim Gillies is a Denver photographer specializing in lifestyle photography, family portraits, newborn photography, and more. Tim Gillies is one the highest rated Denver photographers with over 45 5-star reviews on Google. If you’re looking for documentary photography in Denver, contact Tim for your next photo session. See more family photos.